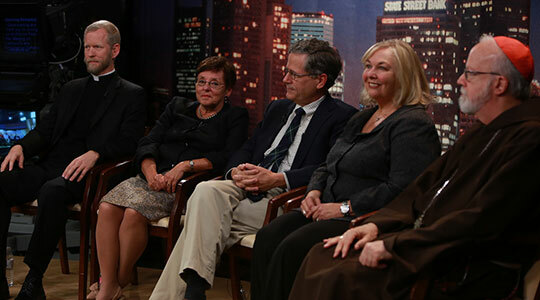 Summary of today’s show: On Wednesday, October 3, Cardinal Sean O’Malley hosted a virtual town hall meeting on physician-assisted suicide that was simulcast on CatholicTV and WQOM. As a Columbus Day special, we’re re-broadcasting the town hall for our listeners in our regular time slot. In addition to Cardinal Seán, the other panelists were M.C. Sullivan of the Committee to Stop Physician-Assisted Suicide; Dr. John Howland, a family physician; Dr. Janet Benestad, Secretary for Faith Formation and Evangelization for the Archdiocese of Boston; and Fr. Tad Pacholczyk of the National Catholic Bioethics Center. John Monahan was the moderator and several members of the studio audience submitted questions in addition to those received via Facebook, Twitter, and email.